Question Answers Of "Arranging A Marriage In India". 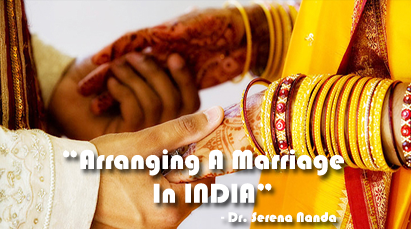 "Arranging A Marriage In India" is written by Serena Nanda. Serena Nanda (Born: August 13, 1938, New York, United States) is a professor of anthropology at John Jay College of Criminal Justice, City University of New York. Her one of the popular book is "The Gift of a Bride:A Tale of Anthropology, Matrimony and Murder", a novel set in an Indian immigrant community in New York City. She has published many books and articles on woman justice. She always has been captivated by the stories people tell and by the tapestry of human diversity. Anthropology has been the perfect way for her to immerse herself in these passions, and through teaching the world the importance of understanding human similarities and differences. Serena Nanda visited India and wrote this essay. In this essay, Nanda has described the arranged marriage in India. Question Answers Of "Arranging A Marriage In India"
Answer: Nanda wrote "Arranging A Marriage In India" in 1992, stating that, at that time, "In India, all marriages were arranged." This is August 2016. There is a vast different of time in between these two dates. The people in India have different religions, cultures and tribes but their own values and rules are in practice. About 24 years have passed. But a culture or religion cannot be changed within a short period of time. Impact of western fashion and culture has engulfed all the world but some religious and cultural faiths are not changed yet. It takes a long time to develop and change a culture. Though some time has passed, the marriage culture of India may not have changed yet. It is because in India even the social, economic, educational status has not completely changed; it is still a developing country. Therefore, we can say that this is still in practice in India. This system has neither changed in India nor in Nepal. This culture has a long history and connected to the Hindu religion and culture. It is not so easy to change a culture. In the other hand, this concept of an arranged marriage has been in practice for a very long time. If a practice or method is not successful or suitable it will naturally be replaced by another method. As it is considered more practical and long lasting, there are no chances of others. Obviously, we see that the world has changed rapidly but faith of religion and cultures have not changed so fast. In some people love marriages and other types are practised even in India. So, if a method survives for a longer time, that itself is a proof for its success. In Indian arranged marriages, the parents of the bride and bridegrooms do the match-making. In Hindu culture, the marriage is basically fixed by the elders, the couple will adhere carry to good family values and lead a peaceful life. If there is a problem between them, they can readily go to the elders for their advice and help. Most importantly, there is an orderliness and discipline in the arranged marriage, which is very important for life. Since the elders play a major role in this union, they have a responsibility to help the couples to lead a happy and prosperous life. Another significant aspect of the arranged marriage is that the background of the families and the bride of bridegroom's character are given a major share in deciding upon the union. This prevents the foul play and ensures the happy life. Arranged marriage may sound funny and strange in the west as it is very uncommon but it may exist even today not only in India, but also in other many parts of the world because it is supported as more practical and long lasting process of marriage. So, it is still in practice in India and Dr. Nanda is true. Answer: Nepal is a multicultural, multi-religious and multi-ethnic country in South Asia. South Asia is generally dominated by Hinduism. Most people in these countries are Hindus and they follow their own eastern culture. Arranged marriages are not outdated yet in this region. In Asian countries, though there is slight impact of western fashion and culture, many couples get love marriage but arranged marriage is mostly practiced. The Westerners may find it very old and unbelievable to think of. In Nepal arranged marriages are very commonly found. Now as the western culture is gradually influencing the Nepalese life, the bridegroom is allowed to see the bride and have a brief discussion before the marriage is fixed. It seems so stupid and meaningless to a Western to marry in this fashion. It may be wonderful to know how these two strangers can lead a happy and successful life but there is the lowest rate of divorces only in Nepal. The success rate is higher in arranged marriages than in the love marriages in Nepal. Hence, the arranged marriage is still not outdated and failed yet in Nepal and other many countries in Asia. It remains still for a long time. As there is no great change in religious and cultural faith and belief, arranged marriage will be in practice. Answer: A survey was conducted around the Pokhara valley last week. About 200 persons were asked the question by some students of our class. Most of them were married persons and some were not married. We had two questions. First, they were asked this question - Do Nepali prefer "arranged marriages" or "love matches"? When we asked this question individually, about 75% of them said that Nepalese prefer "arranged marriage", and 25% of them said that Nepali prefer "love marriage". Later, they were asked another question, "Do you prefer an arranged marriage or a love marriage?" This time their answer was just like the previous except some youths. Some young generations replied that they like love marriage than arranged one. 60% of them were on behalf of arranged marriages. Only 40% of them wanted love marriage or other type of marriages. The social trend is slightly changing because of the western impact. As a young American woman in India for the first time, I found this custom of arranged marriage oppressive. How could any intelligent young person agree to such a marriage without great reluctance? It was contrary to everything I believed about the importance of romantic love as the only basis of a happy marriage. It also clashed with my strongly held notions that the choice of such an intimate and permanent relationship could be made only by the individuals involved. Had anyone tried to arrange my marriage, I would have been defiant and rebellious! Please give evidence from the text showing that Dr. Nanda did change her mind about the institution of arranged marriage. Which experiences and observation led her to change her mind? Did she change her mind abruptly or gradually? Answer: Eventually, cultural studies are very interesting processes to understand different types of people and their customs, traditions and culture, etc. In this essay also when Dr. Nanda an American professor of anthropology visited India for the first time, she found the system of the arranged marriage very strange and she got astonished. When she talked with Sita, a college graduate, about the arranged marriage, Sita replied very positively about arranged marriage. Dr. Nanda did not find Sita's reasoning disagreeable. But she continued her talking and asking. Dr. Nanda then wanted to know why Sita could marry the first person she had met without having fun after meeting different kinds of people. Sita's answered to this question was that, unlike in America, she was free to enjoy her life and her parents were worried about her marriage whereas American girls were worried whether they would find boys or not. Dr. Nanda was satisfied with Sita's answered. As Indian girls were free from worries, they had self-confidence and natural charm. Dr. Nanda was not wondered why Sita married the person she did not know well. Then Sita replied that in America the boy and the girl know each other so well that there would be no mystery and no romance, but in India the girls have the whole of their married life to get to know and love their husband. This made further sense to Dr. Nanda. Next, when Dr. Nanda was involved in matchmaking, she learned a lot about the Indian way of marriage. Her friend refused to accept one of the unmarried daughters of the parents with five daughters because the bride's relatives would not let her spend much time in her husband's home. It was not a good thing. A bit dissatisfied, she respected her friend's reasoning and geared up for the next prospect. Her friend's did not accept a highly educated girl because she will be too independent and unable to live in the joint family. Moreover, she had even a slightly higher social status than the family of the boy; the bride might think herself too good for them. Therefore, when Dr. Nanda a first time visited India and thought arranged marriage is difficult and time consuming but at the end she was herself tried to find a match and involved in a marriage of her friend's son then she was very happy. This shows that Dr. Nanda changed her attitude of arranged marriage slowly after many years. When Dr. Nanda became a successful matchmaker, she was very much happy. We find that she changed her mind gradually as she became more experienced. Making decision carefully after spending a lot of time has made a marriage a success in India. When she found that such marriage is practical and long lasting than live marriage in western societies, she accepted or liked arranged marriage. Answer: In my view, 'Marriage' is the process to tie a boy and a girl into a relation and make them legal for familial life. It is thought a sacred relation in east but in west it is not taken like this. In west a couple can divorce very easily and marry easily. Therefore we find more cases of divorce in western societies. Marriages are of different types according different religion and culture or castes. In our society also there are many types of marriage but arranged marriage is considered such one that is more practical and durable. We see today many love marriages are in troubles. In this connection arranged marriage is suitable for our society but some corrections are needed in this system. At least freedom of choice of their matching and short conversation to introduction and time to understand each other is necessary. I do not prefer dating, visiting and having fun for long time before marriage like in western societies but boy or girl should give chance to understand about their match. In my society, most of the people prefer to choose arranged marriage. Arranged marriages are long lasting and there are hardly found divorce and quarrel in family. The arranged marriage I like is a very systematic and liberal marriage and not a forced arranged marriage. In an arranged marriage, the parents of the brides or groom expect that their daughter or son will enjoy a higher standard of living. Couples and their parents may have more similar cultural and social backgrounds rather than that of other country's culture. I think western culture very free and dirty; they think marriage is a short game; they can join and quit whenever they like. That is why I would prefer an arranged marriage which is settled by parents, relatives and friends who deal with real personalities to the civilized kind of standard matchmaking . In this matter I have very clear view that arranged marriage are not bad; they are based on practical base and long lasting. So like it. Answer: Obviously, a successful work gives pleasure and a failure gives frustration. I have been involved in many successful matchmaking enterprises in many society. But I never faced more problems like Dr. Nanda in India. I tried once or twice for match making and talked with their parents and soon they agreed. It is because I thought well before visiting the parents and talking about the marriage that either the boy or girl is suitable or not. I was very conscious about their familial background, economic standard, culture, caste, social status etc before going to talk with their parents. That helped me to be success in this work. Dr. Nanda seems to enjoy being a matchmaker. At the end of her essay, she narrates her success in one particular case, after years of trying. She was thrilled. Success at last! Like Dr. Nanda, I have been involved in successful matchmaking enterprises. I also enjoyed it because no match which I did has broken our proved false. Generally, people feel happy at the success and to be sad at the failure; this is human nature. I think the result of the hard work done with pure spirit and without being selfish is more successful and rewarding. That gives me pleasure but any work that is done motivated by profit and selfish spirit may not give good result. Like Dr. Nanda, I also feel so excited when I find the match after sometime's hard work. Obviously, it is not an easy task but if done with proper understanding and management it becomes success and gives pleasure. Answer: "Marriage Is A Private Affair" by Chinua Achebe and "Arranging A Marriage In India" by Dr. Serena Nanda are related to culture or marriage of a Nigerian Society and the other an Indian Society. Chinua Achebe's "Marriage Is A Private Affair" and Nanda's "Arranging A Marriage In India" are connected about marriage. Both are related to marriage but one is from African country and another from Asian country. There are cultural differences between these two countries but both essays are highlighted on freedom of marriage. In Achebe's essay Okeke supports an arranged marriage but his son Nnaemeka supports "love match". In Nanda's essay she finds arranged marriage very irritating but people like arranged marriage. Writers are of different view. Achebe advocated love marriage and Nanda is also from western culture and likes love marriage and thinks arranged marriage is very hard. Therefore, thinking critically, we can say that Dr. Nanda would support Nnaemeka but not his father because she also thinks that marriage is a private affair. Critically, we can think and say that Dr. Nanda would support Nnaemeka because it was a love match. It is because she is from western culture and she likes love-matching and in India she found arranged marriage very hard but she involved in a marriage there because of her friend. She worked for matchmaking but it was not her own interest or support she just helped her friend and wanted to see a marriage ceremony there for her experience and complete her project. We cannot say Nanda changed her attitude and culture of love marriage or adopted an arranged marriage. It was just for her study she supported her friend. She is in favour of love-matching; and she would support Okeke's son Nnaemeka surely. Answer: Certainly everybody likes his/her own native land. Nobody can like other's culture and land except some cases. Generally people like their own country, culture and people but nowadays, due to globalization and capitalistic thought many people see charging their religion and culture for money and comfortable life. In this context, we can surely say that young Indians girls appear happier, more self-confidence, and more at peace with themselves than Kim. If we compare the remarks of the young Indian women interviewed by Serena Nanda with the reminiscences of Elaine H. Kim of growing up in America in the aftermath of the Korean War, we will find the young Indians girls happier, more self-confidence, and more at peace with themselves than Elaine Kim. It is because young Indian girls are living in their country and culture but Kim is in a foreign country where people treat her as a foreign. Although Kim was born in America and spoke English like a native speaker, people would not think and behave like native country. Kim worked hard to become a cheerleader so that she would not be a foreigner, but she would be popular in American society. She struggled for her existence. But the condition is not similar for Indian girls: they are happy, satisfied and haven't facing any racial discrimination and enjoying their own culture, marriage, etc. Answer: Most racial or colour problems exist in American and African countries not in our society. In our society, I think there is no such hard and fast discrimination between colour. It is because here is not such different between black and white. Almost Nepalese are average in colour. Neither African black nor American white people are like Nepalese. This may be the main cause of not having so great problem in skin colour. But in some cases we found it; some girls generally do not prefer boys with black skin though they are not like African blacks. Therefore, I do not think skin colour is a barrier when it comes to marriage. It does not matter for me. Because no Nepalese girl is as dark as African black girl or no boy in Nepal is as black as an African black. We are normal in colour; so I like my match of any colour. In my view, skin colour is nothing for Marriage but skill, character and talent as well as understanding are vital necessity for today's match. In all marriage, marriage is not a dating that we can change whenever we can change our partner. It should be long lasting and practical. The skin colour of a person does not matter. We should understand our partner; share our dreams, goals and desires. We should be pillar or supporter of each other. We should be the tender, caring and loving. We should avoid areas and topics that might bring us into a line conflict. Therefore, after reading such essays, I prefer my match of any colour; I never choose only white skin because only whiteness in skin can do nothing. Answer: In our society, skin colour is not of great value for a match but it has great issue in many societies around the world. Today, we see some people prefer black colour and African girls than white ones. It has changed the concept of colour. It was in the past that only white colour people are superior, rich, strong and wise because first they developed many new things and became rich and civilized. As white people entered south Asian country like India, they seemed very handsome, tall, rich, and powerful. So people thought that white are superior. But today the scenario has changed. In America also blacks are preferred. For example: Barak Obama has become the president of America who is black. This has changed the concept of whites and blacks. Further, the fascination with fair skin may be rooted in a number of things. One, dark skin is associated with labour and field work in the sun, and fair skin with wealth, aristocracy and higher education. That plays a definite role in maintaining the bias, it is only illusion. It's not that they colonized countries because they were white. Fairness is equated with superiority, power and influence, therefore they prefer lighter skin. We see that in early commentary on religious text, the origin of dark skin is said to be a curse of God or bad omen. In some interpretations, the black is described as sinner, devil and demon. But the colour of the angels and fairies is white. In the other hand black is supposed as night, anger, disaster, failure, illiterate etc, negative but white as positive. These may be the causes of preference of white skin but today it is not so. Many black girls are supposed as black beauty, black skin people are supposed to be hardworking, laborious, and more loyal than the whites. Nowadays the whites are supposed as vegabond, cheater, and lazy persons. This older meaning has been largely forgotten in today's modern days. Bachelor Level Course "Arranging A Marriage In INDIA"
Answer Questions Of "Arranging A Marriage In INDIA"
Complete Solution Of "Arranging A Marriage In INDIA"
0 Response to "Arranging A Marriage In INDIA | Question and Answers"